Many of us exercise on a regular basis. We lift weights at the gym or in the comforts of our own home, fully intending to build strength while maintaining our health and fitness. That's a simple reason, really, for all that heave-ho we do with that iron. Today, I'm asking you to dive a little deeper into exactly why you lift because...really, though. What is strength? Is it truly nothing more than our muscles' ability to exert force on an object? I believe that's part of it, sure. But true strength goes beyond that. Don't you think? Strength is a multifaceted beast, and as such, many of us fail to see the various sides of it. We dead lift and curl (and run!) until there's no tomorrow, constantly pushing ourselves to lift just five more pounds. But what we fail to recognize is the mental strength it takes to do it. While we train our muscles, we're training out minds, too. Do you realize this? It takes discipline, courage and willpower to achieve the milestones we set out for ourselves in the gym. All that exercise, it makes daily physical activity easier. That's a fact. But the mental challenges we overcome when faced with weights and barbells and repetitions or miles...our will and ability to overcome all that can be directly applied to the mental challenges we face in our jobs, with our families and friends, even while we're out in public just taking on life. Strength is not just your ability to lift a heavy weight. Strength is the bigger picture. Your ability to create a you that faces life with the power to achieve and believe. 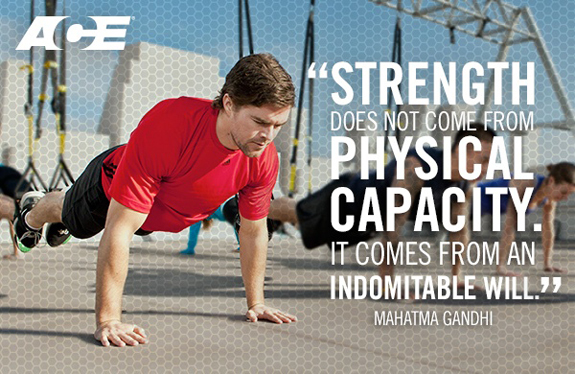 Strength is the force output that originates in your muscles and your mind. Because when all of these things join forces and emanate from within, you become the strong force that impacts your own life. Question: What makes you feel strong? I'm one of those people that finds new "mantras" or goals on a fairly regular basis because I forget about the previous one or it just wasn't working for me anymore. Lately I'm trying to focus on finding one moment of strength in each day, mental or physical. Today's was actually getting up to workout at 5 a.m. even though I did not sleep well. Those extra 45 minutes of sleep would have been AMAZING but I'm proud of myself for that mental strength today. Now where's the coffee? I always tell my boot camp that they are not only strengthening their muscles, but their mind! I feel my strength after a good run or conquering a mountain. My longest hike to date is 11miles in 4 hours. The 5th mile is where I hit my wall mentally and physically- every time. But I always have my husband to talk me through it and it feels awesome when we finish. Like I conquered the world! Exactly! Believing in yourself and your body is half the battle! Coffee makes every sleepy morning that much better, amiright? Kudos to you for waking up and getting it done. When I have mornings like that, my personal mantra becomes: "whatwillyoufeellikewhenitsdone...whatwillyoufeellikewhenitsdone...sogood...sogood.." Haha! I wish I knew- it's a total mental thing I am sure.